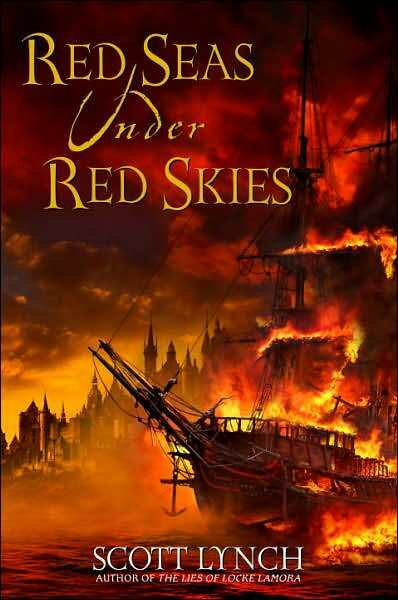 Red Seas under Red Skies is the second book in Scott Lynch’s Gentleman Bastards series (the first of which I reviewed a while ago called The Lies of Locke Lamora). This book is set in a different location with different adventures but still follows the main characters Locke and Jean while they try to rip off a gambling house and are thrust into life on the high seas. I really enjoy Lynch’s writing style. I think I burst out laughing quite a few times in this book. He has some of the most clever ways to curse and some of the most hilarious dialogue I’ve read in a long time. That’s a huge plus to me, but that’s not all a book can sustain itself on. While Lynch’s writing style remains solid and enjoyable (he is a very talented author), the book does have one major flaw: It was very similar to the first book. Lots of swashbuckling adventures, huge odds, outrageous situations, hilarity and all that with different names and cities thrown in. I’m not saying that’s necessarily a bad thing. It just seemed to get kind of…tired toward the end of the book. I really do enjoy Lynch and I love, love, love the Gentleman Bastards books but I hope he changes it up in the next book. I can see this vein of storytelling getting old, which is sad because he really is an amazing author. Book two seemed more like an enjoyable read than a book I can devour because of how amazing it is (like the first book was, to me). I enjoyed this book, but it took me a lot longer to read because it really wasn’t incredibly unique. His stories are well thought out, well planned with intricate detail that he must have spent many-a-hour puzzling over. I always find myself kind of amazed at how all of Locke’s plans work out. Lynch really must have spent some time figuring out how to get it all to work right. It’s well worth the read. My only real complaint is that the storyline is getting a little old because it seemed to turn into the same-old-same-old as the first book with a few differences thrown in. This book online does have rave reviews and it truly deserves them because it really is a hell of a book. It’s an enjoyable read, fantastically written and very well thought out. My only complaint (literally) is the fact that it seemed too much like The Lies of Locke Lamora. I will read the next book in the series because I truly love Lynch’s writing style and intricate plots. I’m a huge Lynch fan, and while this book did slightly disappoint me, it was still a strong follow up to The Lies of Locke Lamora. I also realize that many “second books” in series suffer symptoms much like this one. The flaws I am discussing here, are in no way unique to this book. For this being Lynch’s first series published, I remain impressed. These books deserve a spot on my re-read shelf. I will recommend this to: Anyone who enjoyed The Lies of Locke Lamora, People who enjoy Joe Abercrombie and/or Brent Weeks, those who like to read about thieves, swashbuckling adventures and all that happy stuff.